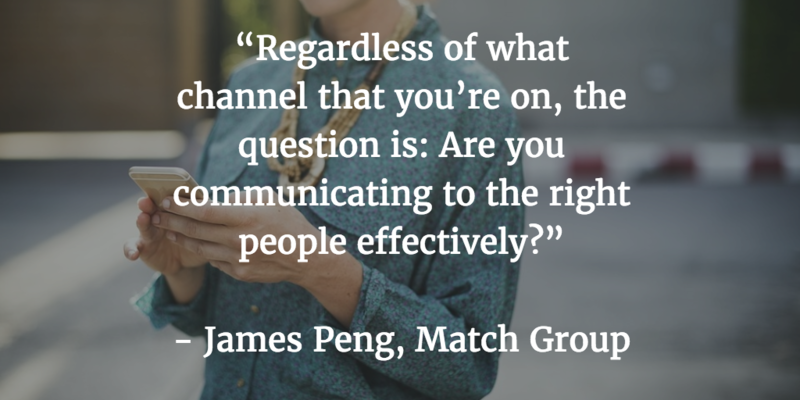 James Peng knows a thing or two about mobile user acquisition. As the former head of user acquisition and monetization at Storm8 and current head of mobile and social acquisition at dating giant Match Group (owners of Tinder, Match.com, and OkCupid), he’s built and scaled multimillion dollar user acquisition strategies for both mobile games and dating apps. Tinder, one of the Match Group’s top dating apps, last week landed the #1 spot on top overall grossing chart in the U.S. Apple App Store. In this exclusive interview, Peng shares tips on how to tackle some of the biggest challenges companies—both gaming and brands—face with mobile user acquisition, so that your company can make the most of its marketing budget. He emphasizes how smarter use of data can improve your chances of UA success. Lastly, he explains how to assess the myriad user acquisition channels in order to find and target the right users for your game or app. Scott Reyburn, Fyber: What was the path that led you to working in user acquisition, beginning at Storm8? James Peng, Match: One of my biggest motivations for joining Storm8 was because mobile gaming was where some of the most sophisticated and largest scale user acquisition was taking place. Razor-thin margins and aggressive competition forced casual gaming companies to refine their product and marketing strategy down to the decimal point in order to stay ahead. My goal was to master mobile, and to understand the range of channels that could be deployed to drive momentum. Storm8 came from a fortunate position of being an early entrant to the app stores on Google and Apple, and was able to grow a large user base organically through multiple hits and effective cross promotion. They had the fortune of being able to cross promote quite a bit and rely on just organic traffic for the most part. When I was hired, they were looking to take their user base to the next level, and I was fortunate to have the opportunity to build their acquisition platform from the ground up. Scott: With all of the lessons that you’ve learned at Storm8, what was the first thing you did, or wanted to do, with Match’s UA strategy when you started working there? James: Match is an over two-decade-old business—and one that started on desktop. My goal in joining was to provide the expertise to help to pivot the business over to mobile by bringing channel knowledge, understanding of mobile attribution, and creative approach to mobile publishers. The first thing I applied was a deeply segmented approach to social channels, based off of the knowledge base I built in gaming—in short, how to drill down and precisely target the right users. I also brought in the channel expertise across the various ad networks, direct partners, programmatic platforms, etc. Scott: What were some key strategic moves early on that moved the needle after you settled in and got your strategy in place at Match? Was there anything you hadn’t thought of, or even surprised you? James: The biggest difference between gaming and non-gaming is channel composition. Our goal at Match is to find a specific kind of user. Our users have a specific demographic and also psychographic range, for example, not only a single male of a certain age, but also one who is on the dating market. When you look at the world of ad networks and various channels out there, the reality is that most publishers don’t know these dimensions about their users, so it’s not easy to understand whether or not they’re going to be the right audience for you. We need to be able to cut up a publisher and isolate the users that we think are the most viable for us. When you advertise an app, there’s a lot of people that might play a casual game, however, when you’re talking about a dating app, you got to be much more specific. Because if you’re advertising to a game that’s predominantly kids, you’re going to have problems. Scott: How can companies think more creatively about the data they collect and use for mobile advertising? James: There’s a range of data from probabilistic to deterministic. For example, if you’re an app that has location enabled, you can potentially use location to understand where the users are at and how you can use that to understand different behaviors or improve your targeting. Let’s say that you’re an app that requires the user to input their age and gender, then you have a deterministic picture of who the user is, at least demographically. Most times, useful data is in limited supply, so you’ve got to be resourceful with what’s available. For instance, let’s say that you’re selling umbrellas and you want to find people where it makes sense. If you’re advertising in a weather app, it might make sense to advertise to people in areas where it’s raining quite a bit or approaching rainy season. Smart use of data can enhance your ability to succeed. Scott: What has been the most difficult or challenging part of managing mobile UA for Match? James: A challenge would be targeting on a lot of channels that are non-social. Because of that, I’m forced to look for routes that are the most scalable yet accurate. I might have to do direct deals with apps that have enough traffic, data, and targeting that makes sense. That’s the tough part—it’s the diversity that I need in order to get enough scale and the amount of work it takes to work with every new partner. As you can imagine, every individual partner could have their own self-serve or team that you’d have to learn to work with. It’s not as plug and play as working with a network or working with Fyber. These partners aren’t use to the volume and number of advertisers that Fyber is used to, for example. Another big challenge is dealing with the fraud that comes from working with sources that are semi-transparent or network-based overall. On the flip side, what’s nice about it is that we have a lot of data. Even though it’s hard to scale and find the right users, we still know a lot about who we are looking for. Therefore, when we go to channels that understand their users, then there’s a lot of potential for us to zero in on it and succeed. Scott: You talked about the difficulty in working with multiple channels. How does your team at Match manage and optimize various campaigns across a bunch of channels? James: We try to align all of our managers with the platforms that they’re working on. For example, Facebook is focused on people-oriented targeting, so we organize accordingly. The key thing for us is to think about the publishers and channels that we are advertising on, and how we can align most with them in order to think about it in the same way that they do. Scott: Is there something to be said about the speed at which you’re able to analyze and execute on data? James: We’ve invested in tools in order to be able to assess backend performance as well as eliminate as many steps between the publishing channels and the people that are making decisions in advertising. We’ve worked on automating all of these elements of the process so we can make quick and smart decisions. Scott: In terms of metrics, are there any type of soft metrics that you’re tracking, and why are you tracking them? James: We care a lot about our ecosystem and are always tracking demographic balance. For example, if we are getting in enough females of a certain age versus males, etc. Also, we spend significant time on ad efficiency, making sure we are getting the most out of our impressions. We want to make sure that if we find the right user, we can win the impressions they see. Scott: Does Match solely focus their UA on acquiring only the highest paying users? Are you ensuring Match acquires the widest spread of users, not limiting to just the top payers? James: It’s a sliding scale. If you tell me my budget was $100, then I would spend it on the highest ROI opportunities. But if you tell me my budget was $1 billion, then that would be a very different answer. We spend as efficiently as possible with the highest propensity of paying users as much as possible , and then work from there. There’s definitely a fine balance, but at the end of the day, if we have a set number of dollars, our job is to spend those dollars the most efficiently to achieve all of our goals. All of those goals are a combination of not just ROI but user goals as well. There are so many things that we are trying to triangulate for. Scott: Was there anything you wish you knew about being a UA professional for a non-gaming company? And is there one lesson, or more than one, you’d like to impart with other UA professionals at non-gaming companies? James: Targeting is one of the most critical components to success in non-gaming UA. Regardless of what channel that you’re on, the question is: Are you communicating to the right people effectively? You need to understand who you’re looking for and where you can access their attention efficiently. Scott: And what sort of hard or soft skills did you have to make you successful in mobile user acquisition? And what is something that would be helpful to someone else who would want to develop these skills and pursue this career? James: A hard skill is the raw analytical horsepower, including the ability to distill large amounts of data into actionable insights. When it comes to soft skills, I’d say thinking creatively about solutions to the biggest problems that you have because our industry is evolving so quickly that you need to be able to adapt and think outside the normal constructs. Last but certainly not least, it’s important to have a good attitude. Scott: Lastly, what’s next for the Match Group? James: We recently rolled out Tinder Gold to all of our users globally last month. 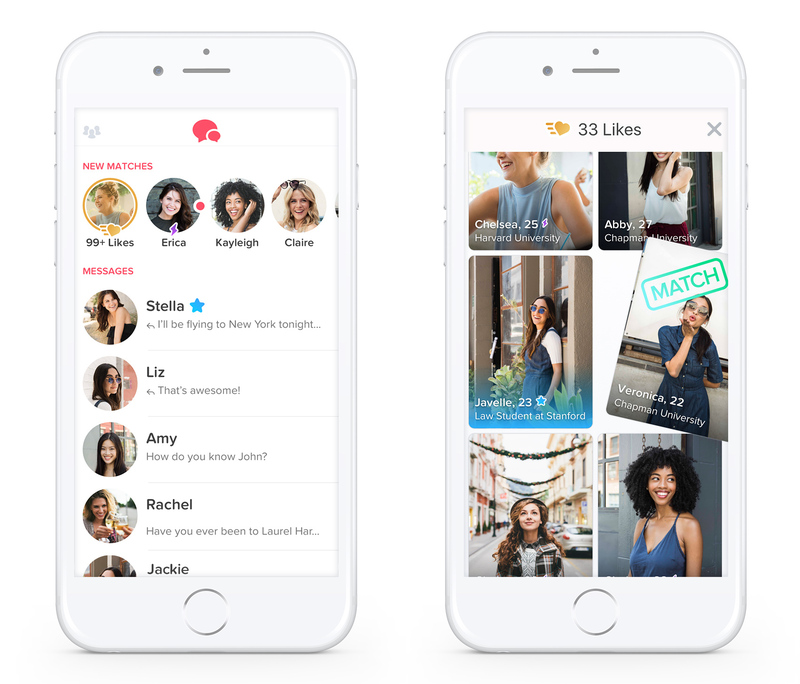 Tinder Gold is our members-only service that offers users the ability to see who has liked them before swiping, as well as other premium features such as Passport, Rewind, Unlimited Likes, and more. The reception so far has been great. Tinder, for the first time ever, reached #1 on the App Store’s top grossing chart in the U.S.